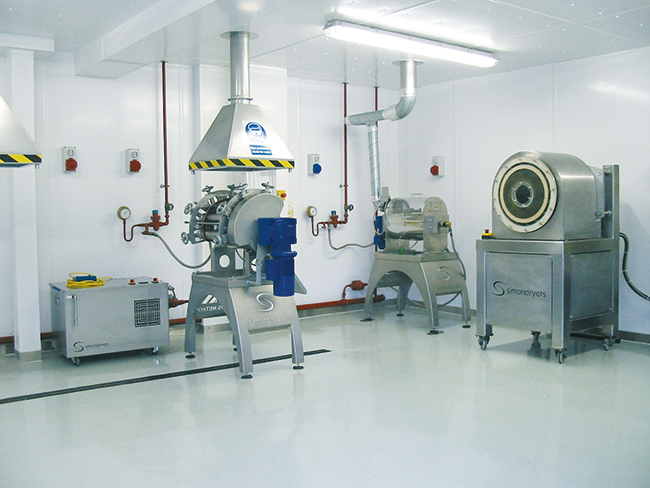 Simon Dryers have over 100 years' experience in drying and cooling various food and chemica! products. As part of our service, we offer full testing facilities at our works. In this ever-changing world, new products and formulations are constantly being produced and tests are required to determine suitability with our equipment. With records of previous tests going back to the 1920's, we can use this knowledge when setting up for Tests are performed using our laboratory size machines and the data from each test allows for sealing-up to production machine size. Our facilities include Drum Dryers and Flakers for handling liquid products, Tubular Dryers and Coolers for powder products and Rotary Louvre Dryers for crystalline or granularproducts. We also provide suitable feed systems complete with pumps and a mill sifterfor grinding final dried product, if required. Our laboratory is equipped with suitable systems for recording product moisture contents, air and product temperatures and air humidity. Our test facilities are staed by experienced operators, fully supported by engineers and design sta. We would usually ask for approximately 25 litres of product for testing, depending on material. This allows for a number of individual tests, allowing us to alter parameters such as speeds and temperatures, to ensure the most suitable operating conditions for a production machine. A full test report will be produced, detailing methods, temperatures, times, etc., together with a short video showing the actual test. Dried/cooled samples from the tests will be returned for customer evaluation. Product testing is charged to customers, but test charges are refunded to customers who proceed to purchase a production machine.